Utility is the overall usefulness you get from something. Everyone instinctively makes decisions based on utility all the time, but do you consider it when you make a big purchase or setup a budget? April 30, 2018, 9:46 p.m.
March 8, 2018, 7:44 a.m.
What if you ignored prices for a couple weeks and bought whatever you wanted? You’d collect some really cool belongings and memories but probably end up broke… Rather than ignoring prices or the opposite (obsessing over getting the cheapest price), what makes more sense is to look at what you actually get for your money. That’s called utility. The concept of utility comes from economics. Utility is the overall usefulness you get from something. One way to think of utility is “bang for your buck”. So utility is not money, but money buys utility. Everyone instinctively makes decisions based on utility all the time (e.g., what should I wear today since it is rainy, what sounds good for breakfast, which podcast should I listen to on the way to work). The economic theory behind utility is that rational people maximize utility while minimizing cost. In other words rational people pick the most useful option for the least amount of money. The amount of utility you get from something changes as you use it. A good example is ice cream. Imagine a bowl of your favorite ice cream sitting in front of you. What flavor is it? Mine is mint chocolate chip. The first bite is so good, when the spoon hits my mouth the hair on the back of my neck stands up. I can’t wait to have another bite. The second bite is really good, but not as good as the first. The next bite is good, but now the hair on my neck is calmed down. By the time I get to the last bite my mouth is kind of cold and I’m still enjoying the flavor, but I’ve had enough. If I kept eating I’d start experiencing negative utility (fullness, bloating) and eventually I’d get sick. One bowl was the perfect amount. 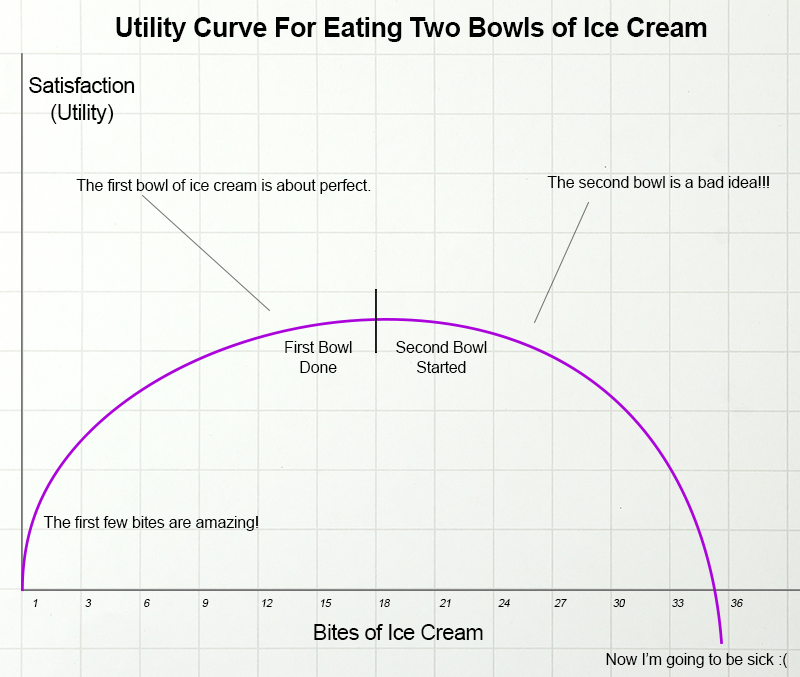 In terms of utility 2 bowls of ice cream in one setting is twice the price, but not double the happiness. More is not always better when looking through the lens of utility. In the real world we have thousands products and services to choose from. We can even choose invest our money (delay gratification) instead of spend it. 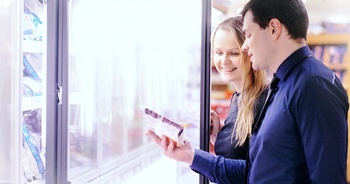 For the purposes of your budget, the point is to put yourself in the position of the first bites of ice cream with everything you spend on and avoid paying for things you either don't use or already have too much of. The economic theory of utility works for me, except the part about “rational people”! In practice, people are not rational all the time, including when it comes to sticking to a budget. Spending decisions are influenced by emotions stemming from fear, greed, self image issues, impulses, etc. It doesn’t help that advertisements are constantly trying to convince people to spend money on things they don’t need. This is where doing research on products and delaying gratification helps to maximize utility. Related to rational thought, or lack thereof, a lot of decisions people make are short term. For example, if you eat a party size bag of potato chips for lunch it feels good in the moment, but not so good an hour or two later. Plus if you do that every day for four years you’re going to end up with serious health issues. Just because something is good right now doesn’t mean it is good long term. If you are serious about financial freedom, sticking to your budget, and growing your net worth make sure “current you” and “future you” are part of every major decision. Part of maximizing utility is using things until they completely wear out. Why buy a new pair of shoes if the current ones still look good and fit well? It takes discipline to wear stuff out because it is so tempting to go for the upgrade. Our consumer driven society is setup to give people the immediate yet temporary dopamine rush of that new shiney object, utility be damned. Speaking of dopamine, those who shop as a form or entertainment “because baby I’m worth it” cannot possibly use all the stuff they buy. A person only needs so many pairs of shoes, and just like the ice cream example the utility of the 15th pair of sneakers is small compared to the first or second pair. Items that are used infrequently have low utility. Consider a motorcycle that collects dust in the garage or that high end speaker system that is only turned on once a month. In these cases the idea of owning the product is providing more utility than the actual item itself. These are also examples of depreciating assets that lose value while you sleep - not good investments. That money could have been put to better use elsewhere (like building up a nest egg). Buying cheap does not necessarily mean high utility either. The opposite of a spendthrift is a cheap-o who buys the cheapest thing even if the more expensive option would pay for itself in the medium to long run. A low price usually means low quality or some negative impact on your time or budget later. Being thrifty and seeking out good deals is great but do not forget to factor in the value of your own time. Ikea furniture is a perfect example. Yeah it is cheap, but you have to put it together. Ikea outsourced the assembly to you. What is your hourly rate? Was it worth it? If you make good money and don’t have much free time, then Ikea is a pain in the neck. I have personally learned that lesson the hard way several times… Ikea’s low prices and good marketing are hard to resist. See the psychology behind why couples always fight when assembling Ikea furniture. The Question Is What Are We Trying to Get the Most Of? Even though the Camaro has more total horsepower, in terms of $/hp and price the Mustang wins. Source: Top horsepower-per-dollar cars in 2017. Now let’s say you are in the market for a car to drive to and from work. Extra horsepower is arguably a complete waste of money in that situation. Realistically you won’t be drag racing your way to work or driving much faster than 80 miles per hour. As long as a car can merge in ordinary traffic it does the job fine. An $18k Toyota Corolla would do the job very well. Granted the Corolla isn’t as fun to drive as a Mustang and doesn’t look as cool, but is the Mustang really worth it? You’d get the same amount of commuting utility out of the Corolla for about $15k less than the Mustang. It is a completely personal choice, my brain says the Corolla but my heart says the Mustang. Earlier I said “utility is not money, but money buys utility”. For people on the path to financial freedom and early retirement money itself has utility. Money that is saved can be invested and put to work for you so it grows on its own. It eventually becomes an income stream allowing a change in lifestyle. The tools at this website (budget tracker, net worth dashboard, income spending simulator) are designed to help you organize your finances and get the most utility out of your money. Best of luck and please share your thoughts on the idea of utility below.